A program of expanded health services for YMSM of color between the ages of 18-29 and their partners. 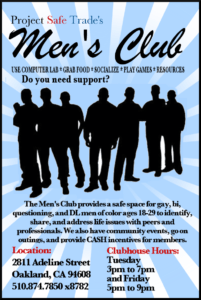 Services include: drop-in center, on site mental health and substance use counseling, HIV/HCV testing, PrEP linkage, social outings, community events, life skills support and case management services. African Americans represented about 12% of the US population, but accounted for an estimated 44% (19,540) of HIV diagnoses. Hispanics/Latinos represented about 17% of the US population, but accounted for an estimated 23% (10,201) of HIV diagnoses. Laboratory and real-life studies of couples in which one partner has HIV and the other doesn’t show that condoms are highly protective against HIV when used correctly and consistently.